Love it!! Everything I expected. Dimensions 126.0 In. X 94.0 In. X 0.5 In. Beautiful rug. It blends and complements so well our furniture! I love its different color shades. It creates a dynamic effect while being elegant. I'm glad I bought this rug, after looking at hundreds of them! Looks so nice! This rug is beautiful in person! The teal is bright and rich and the navy is very deep...it is much thinner than any other rig i have owned but not in a cheap flimsy way. Overall its gorgeous and hasnt pilled or shed at all which is a huge plus!!! 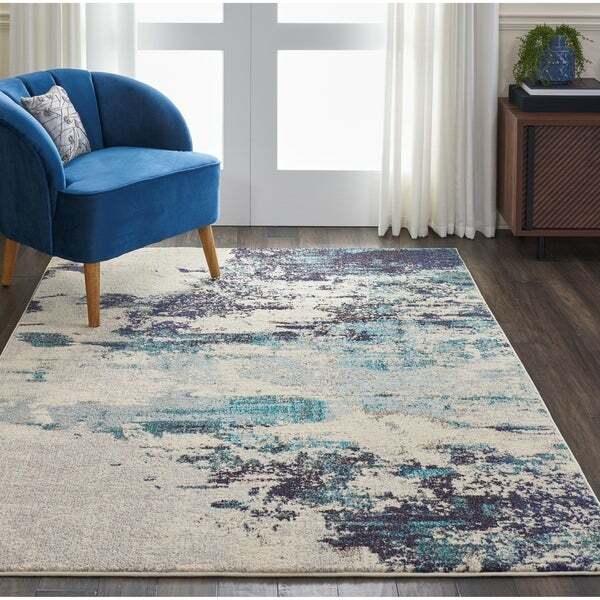 This rug was just what I was looking for, the colors are exactly as shown, in the photos online. It looks great in my dining room. Soft and matches well with my blue/teal decor. Some color, some light areas so hides dirt and vacuums well. Nice rug. It didn’t look good in our space mainly because our colors were different than the stock photo. It also had other colors in the weave that we were not expecting - including some indigo, purple, and even pink. Gorgeous rug. I get so many compliments on it! The colors are vibrant and looks just as it is pictured. It's thinner than I expected but still very nice!